Update: The new Nexus might not run Android at all, but a Chrome/Android hybrid called Andromeda. And despite Google seemingly ditching the Nexus name for phones the company might keep it for this slate. Google is expected to launch two new smartphones in a matter of weeks and rumors about them have been rolling in for months, but now it seems they might not be alone, with recent talk turning to a new Nexus 7 tablet. The slate, which is said to be built by Huawei, may not carry the Nexus name at all though, as with Google seemingly switching Nexus for Pixel on its phones we could be getting the Pixel 7 or the Pixel 7P instead. On the other hand, most rumors refer to it as a Nexus, so we wouldn't count on a name change. Whatever the slate ends up being called it's shaping up to be a high-end tablet and a worthy successor to the previous Nexus 7. Here's what we've heard so far. The first news of the new Nexus 7 came from famed leaker @evleaks, who tweeted that it's "on track for release before the end of the year." Assuming he's right – and he often is – the single most likely date for an announcement is October 4, as that's when it's rumored that the Pixel and Pixel XL smartphones will be announced, and it would make sense for Google to launch its new slate alongside them. Of course that's not when you'll necessarily be able to buy it, and the only date we have for a potential retail release is October 20, as that's when one source reckons the Pixel will go on sale (though there's no mention of the Pixel XL or Nexus 7). While that all sounds workable, the fact that we're only just starting to hear about the new Nexus 7 suggests it could still be further out than that, so it's possible we'll be waiting until nearer the end of the year. TechRadar's take: October 4 seems the single most likely date for an announcement, as if not then Google would have to hold two hardware events in the space of a couple of months assuming the new Nexus 7 really is coming this year, but the lack of leaks until recently raises a red flag. There are no design rumors at all yet and several directions Huawei could go in. The slate could be inspired by the previous Nexus 7, with its matt plastic back, or by the more recent Pixel C, with its anodized aluminum finish. Then again, with Huawei at the helm the company might borrow from its own Huawei P9 flagship phone, with its aluminum unibody, or from the upcoming Pixel and Pixel XL, which if leaks are to be believed offer a rounded two-tone metal body. We have slightly more to go on for the screen, with rumors of a 7-inch 1440 x 2560 display. That would make for a sharp screen, with the larger iPad mini 4 by comparison coming in at just 1536 x 2048. That said, it's a QHD resolution, matched by many smartphones with smaller screens, so it's not unrealistic. TechRadar's take: A similar design to the Pixel and Pixel XL would make sense, to mark the three out as part of the same range of devices, so we'd guess at a two-tone metal body, but metal of some form seems likely regardless, since both the Huawei P9 and Pixel C are metal too. The screen is sure to be 7 inches, since this is expected to be a successor to the Nexus 7. The resolution is less set in stone, but the rumors of 1440 x 2560 are believable. Apparently the new Nexus 7 will have a 13MP camera, which is a high megapixel count for a tablet, though only one source so far has offered camera specs and they claimed to be basing them off a pre-production model, so the specs could change, even if they're accurate. Another possibility is that the camera will be 12MP, as that's been rumored for the Pixel and Pixel XL, plus the Huawei P9 has a 12MP snapper. There's no news on what spec the front-facing camera will be, though if we look at the above phones it could be 8MP, as that's both what the camera on the Pixel is rumored to be and the same spec as the camera on the Huawei P9. Of course these are phones, not tablets, so the new Nexus 7 could have a different spec altogether. Battery life remains a complete mystery for now, but Huawei isn't especially known for long-lasting devices. TechRadar's take: While high for a tablet, cameras of around 12/13MP have become the smartphone standard, so it's believable we'd see that here. A Snapdragon 820 processor has been attached to the Nexus 7 by one rumor. That's a flagship chip, used by the likes of the LG G5 and HTC 10, though it's not quite Qualcomm's latest, with the Snapdragon 821 now launched. Still, it's plenty powerful, especially for a tablet range that's never been known for its specs. That could be coupled with 4GB of RAM, a figure that's been put forward by two separate sources and one which again matches up with most flagship phones. 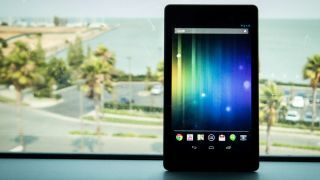 As a Google device the new Nexus 7 should be on the latest version of Android – so probably either Android 7.0 or Android 7.1, depending on when it launches. That's if it's running Android at all though, as recent rumors suggest it could actually run Andromeda - a new operating system that combines Android and Chrome. If so then the new Nexus 7 could be the first device to run Andromeda. The slate is also likely to be first in line for Android updates (or Andromeda updates), which along with running a bloat-free version of the operating system is one of the key selling points of Nexus devices. TechRadar's take: A Snapdragon 820 processor and 4GB of RAM would be hefty but believable specs for Google's next slate, since phones have been packing that much power for months now. There's also a good chance we'll be up to Android 7.1 by the time the new Nexus 7 lands, but with talk of Andromeda it may not run Android at all. The New Nexus 7 probably won't be packed full of features, given that it's likely to put price first, but there are some significant things that we might see. For one thing, the new slate might have a fingerprint scanner, given that the new Pixel phones are expected to have one and many of Huawei's handsets have one. While scanners aren't quite as common on tablets yet they're also far from rare. The new Nexus 7 might also support an optional keyboard accessory if it follows the Pixel C's lead, though the smaller size could make that a worse fit. One thing we almost certainly won't get is a microSD card slot, given that Nexus devices never have them. That's a shame, but a 64GB internal capacity has been rumored, so at least the new Nexus 7 might not be stingy on built-in storage. TechRadar's take: Don't count on a keyboard, but we wouldn't be surprised to see a fingerprint scanner on the new Nexus 7. 64GB of storage is believable too, especially as you could get that much with the Pixel C.
The Android tablet landscape is largely devoid of big name slates, especially at the 7-inch size, so the new Nexus 7's biggest competitor is likely to be the iPad mini 4, along with the iPad mini 2, which is still on sale at a relatively budget price. These slates both offer a stylish, premium build and in the case of the iPad mini 4 a fingerprint scanner and plenty of power too. But the biggest difference of course is that they run iOS rather than Android. In Android land the new Nexus 7's biggest rival could be the Samsung Galaxy Tab S2 8.0, a slate with a thin and light design, a fingerprint scanner and a microSD card slot, though the specs are starting to feel a bit dated. At some point we're also expecting to see the Samsung Galaxy Tab S3. There's no word on what the new Nexus 7 might cost, but it's possible that it will be in line with the previous model. That originally launched at $229/£199 (around AU$300) for a 16GB version and $269/£240 (around AU$350) for 32GB. But that was back in 2013 and we might be looking at 64GB of storage in the new Nexus 7, all of which suggests it will cost more than that. TechRadar's take: We'd guess the new Nexus 7 will slot in somewhere between the $269/£239/AU$369 iPad mini 2 and the $399/£379/AU$569 iPad mini 4, so it could be around $330/£300/AU$470.